Augustin Trapenard kindly agreed to respond to my previous post entitled "Emily Brontë's Diary Papers: Genius or Just Genial?" 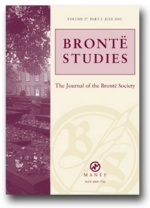 Thank you so much for mentioning my paper "Auctorial (im)postures in Emily Brontë's Diary Papers". I found your review pretty interesting / challenging and it's always nice to confront your point of view with another Brontë lover ! If I may, however, I would like to try and make myself clearer. 1. At the end of the first paragraph, I clearly specify that the autobiographical fragments are particularly interesting as they bear the only comments that Emily ever made on her own writing. This is why they deserve, in my opinion, a close analysis. In other words, the point here is not the quality or complexity of Emily's writing but the fact she pictures herself at work - in her words and drawings. 2. When I write that "the two sisters’ auctorial postures were at first deliberately staged as a discursive imposture", I simply comment on their original shared / joint authorship. The speech situation was indeed rather unique as they posed as one unique speaker. Who actually wrote what, we don't know and we're not supposed to. About the "illegible blotch", I'm not denying the alleged untidiness of Emily : I'm just proving that these texts were NOT meant to be read by anyone else than her and her sister. 3. Thus, when you write : "What if she really were just an intelligent, wonderful, loving sister who had no literary inclinations at all", you're not far, actually, from agreeing with me ! I'm precisely saying that these papers were mostly a game, and in no way an authorial stance or a literary act. 4. As for Emily's role-playing and "dramatized, protean self-image", you must admit that I refer to the 1845 paper, where Emily stages Anne and herself as actors in a civil war and as multiple fictionalized characters. In my opinion, this taste for story-telling and fiction-making may explain the imaginative leap that made her write "Wuthering Heights".